Status: offline I have or am playing 8 41-45 campaigns and have read almost all the AAR reports and it seems that by the fall of 1942 95% of the games are quit. It would be really nice if there was a way to put in a victory condition indicator that could be put in game based on lose ratio and citys that could be used to deside a winner sooner then 1945, say every March of each year. The other way to solve this problem would be to install a shorter campaign or campaigns, 41 to March 42, 41 - March 43 and 41 - March 44. Players would be much more likely to finish a game. Some kind of sudden death victory conditions at certain dates would work very fine I think, so that if the Soviets (or Axis) didn't hold certain cities or a certain number of VP:s at a given date, it would be game over. It would also encourage historical play in trying to hold Kiev for example. I have done about half of an excel sheet with historical capture turns for the cities in the game, but it was a lot of work so I tired. Edit: BTW how do you have the time for 8 campaigns? I have my hands full with two! I do think it would be helpful in such cases to be able to determine somehow who "won". Probably by territory occupied, as Tarhunnas is working on. For instance if the game ends in July 1942 and the Germans hold x, y, or z% more population points than the historical Germans, they could win a marginal, decisive, or total victory, etc. Doesn't matter if it is not 100% right, as it will be better than what we have now, which is nothing. I have finished 4 ( all less then 20 turns ) and am now playing 4 at once. turn 32, 10, 10 and 8. I think just shorter campiagns would be best. That way poeple get to pick what they want, so if 76mm wants to go the 41-45 he can. If I want to just play a 41-43 I can. Status: offline Make that only 2 on going now. I guess I will have to do dual poeple. Status: offline I'm playing 4 CG's at once; Opponents are: Kevin Lilly, Zort, Pelton, and Aoline. I'm the Soviet side in all of them. It's getting confusing and I'm thinking never again. 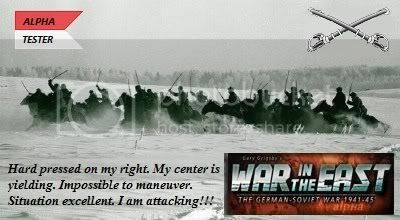 Status: offline I am doing one as the Soviets, against Jajusha, and one as the Germans against Gids. Playing different sides makes it easy to keep them apart, and it's also a great learning experience. I can see what works as one side and what will discomfit the other side the most. I'm playing 4 CG's at once; Opponents are: Kevin Lilly, Zort, Pelton, and Aoline. I'm the Soviet side in all of them. It's getting confusing and I'm thinking never again. I have the same personal problem: I can do one of each side but they begin to all run together if I have two or more on-going from the same side. I don't make notes and depend on memory to maintain strategic continuity. 1 I win if as russian get auto win earlier /later than historical if jerry. [Those who don't like that might instead try swapping sides and winner is the one who has more VPs than the other by whatever date is agreed]. Status: offline I have 2 games going a 41-45 GC against Ketza & the Barbarossa Scenario against Antoarc playing the Soviet side in both I could probably do one more but I wouldn't want to do any more than 3 whatever side I was playing. What about an Automatic Victory that cuts both ways. Maybe use Geographic locations instead of victory points for CG Auto Victory. Use Victory Points for degrees of victory in games lasting many years. Example of what I'm thinking of. If Leningrad, Moscow, Kharkov, Rostov and Sevastapol are Axis controlled, by March 1942, AV. If Leningrad, Moscow, Kharkov, Rostov and Sevastapol are Soviet controlled, by March 1942, AV. Worth considering? You be the judge. Sounds good, but I thk u have to enclude a few more towns and deaths. Like the system we have now with the shorter campaigns. That way the GHC couldn't have huge death rates. Status: offline What the game really needs is a "Collapse Option". When either side has had their will broken, and complete depression sets in. 1 click of a button will start a chain reaction of mass surrender during the next players turn. This will speed up the land grab and of course Victory points gathered. WitE would break new ground in allowing players an option many could embrace. The satisfaction of completing the game with both opponents in agreement. Pavel has that list. We had it on the tester forum a year or so ago but no idea what thread it might have been in. You could always pm Pavel and ask for a copy. What the game really needs is a "Collapse Option". Leaders start binging on schnapps/vodka, wandering off into forests and topping themselves would be a feature of pressing this button.